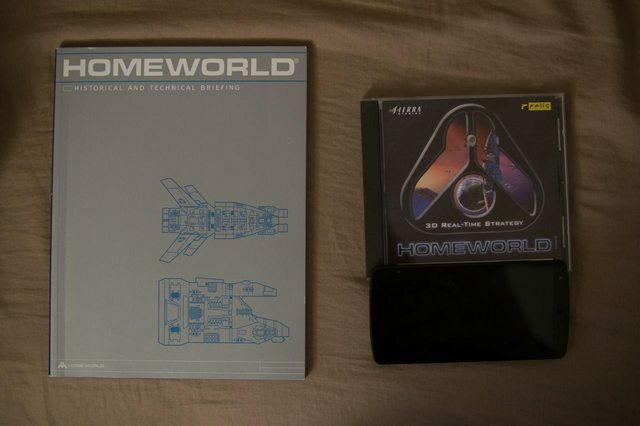 For those of you interested in some semi retro gaming from the long ago era of 1999 I’m going to tell you about Homeworld. Homeworld is a bit of an odd creature, it’s a space based RTS with a working Z axis, it’s got a good plot, the soundtrack is an excellent fit, and the voice talent is memorable for good reasons. There’s not even a lot of imitators this oddball of a game. I remember playing this game back in ’99 when it came out and it being blown away, years later I installed it and found to still be a good game. The core things that hooked held up despite the aging graphics. This was a game that the developers cared enough about that when it came time to write a manual it wasn’t just a simple how-to, instead it was a short novel with that contained fleet tactical briefs and ships logs. You could find yourself reading it simply because it was actually interesting to read. The thing that I always thought was a bit sad was that the developers of this game did a fairly bang up job but with the failure of THQ Publishing the rights to the game went into limbo and despite two follow up games, Cataclysm and Homeworld 2, we would likely never see another Homeworld game. It was disheartening to think of such an excellent game just rotting away on a forgotten assets list of some holding company. Apparently I wasn’t the only one to feel this way. The original creators of Homeworld founded a company that was going to make a bit more of a conventional land based RTS set in a universe that had a similar, but not lawsuit worthy, feel to it. Homeworld was back! Ok maybe it wasn’t technically but at least its spirit would live on. Right? Business and finance aren’t always a kind thing for your cherished childhood toys, and this would prove to be a bitter dose of reality. Early in the development cycle BlackBird Interactive, the creators of Hardware, indicated that as an independent developer they were going to develop Hardware as a bit of a limited game with the potential for microtransactions and paid unlocks. Nothing was set in stone but to your average gamer the language used was not confidence inspiring that the end product would not have its soul removed in the process of getting it to market. And so a dream appeared to have died. Then something happened and that dream got buried even deeper. Gearbox bought the rights to Homeworld from the THQ assets sale. The same unapologetic capitalists who had allowed the 3D Realms abomination called Duke Nukem Forever to be brought to market had purchased Homeworld. What would they do with Homeworld? They had no RTS experience and what we had seen of them showed what they were good at producing was season passes and endless DLC. My fond childhood toy had been given concrete boots and sent for a swim in the Marianas Trench. Only things didn’t turn out at all like you’d expect. It seems that Homeworld had been a game fondly remembered by a few important people at Gearbox and that a business case could be made for doing something unusual with a game that had been made so long ago and laid disused for such a long time. But not just a simple remastering, the original development team was called where possible. The original animators, voice talent, and programmers were engaged to remaster their previous works. Furthermore as many of the developers were working at BlackBird Interactive on Hardware: Shipbreakers an arrangement was struck. Hardware: Shipbreakers would become Homeworld: Shipbreakers and would be given funding to engage in a more traditional release without paid unlocks and limited gameplay. It has been a long wait with immense gaps of silence while what some fans thought would be a rapid upgrade that threw updated textures on existing assets turned into a extensive rebuild that would see the game brought up to 4k gaming standards. Fans grew anxious with preorders in yet no fixed release date and no gameplay footage. Thankfully there is a happy ending in sight as gameplay footage was released along with a somewhat wildcat release date of one month from the time of announcement, Feb 24th. Initial word is that Homeworld 1 and 2 are present and unmolested, running as a combined game and with joint multiplayer. However concessions have been made for a new UI and most fans will agree this is not objectionable. The wait appears to have been worthwhile. While only time will tell if the remaster holds true to the original it doesn’t appear that fans will have to wait long to get their answer. 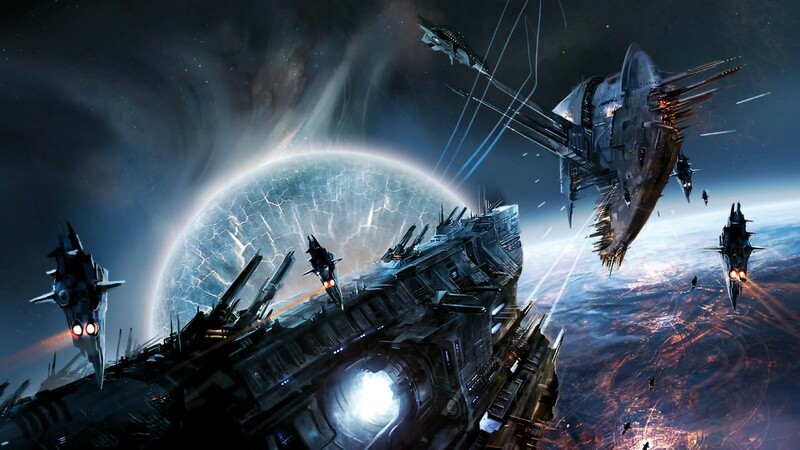 Now if only someone could get through the issues around Homeworld: Cataclysm (partially deleted source code) a new generation would understand that it is indeed possible to make a fully 3d space RTS survival horror game. Yes, it was done once and it worked rather well.